I don’t often make chocolate chip cookies. I love them, but I’m pretty picky. There’s the kind I grew up with, the recipe that came from the back of the chocolate chip bag. I’d help my mom sift the flour (sifting, now there’s a trait I haven’t carried to adulthood) and stir the batter by hand. My favorite part,of course, was adding in the chocolate chips–many which were stuffed inside my cheeks instead of into the mixing bowl. I’ve made vegan chocolate chip cookies, a fantastic oatmeal version, and I tried a recipe that was very similar to the one I grew up with. I’m also pretty enamoured with this maple version. But I wanted to try something new and Ashley over at Not without Salt had the answer. 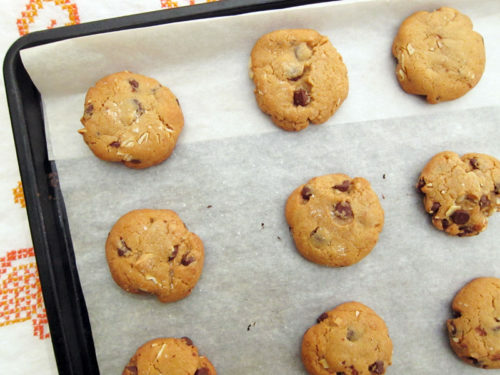 Let me introduce you to the very best chocolate chip cookie recipe ever. Ever. These don’t require extra egg yolks or a 36 hour unbearable wait in the fridge. No fussing about with special ingredients or complicated instructions. Ashley suggests using a good block of chocolate and then using a serrated knife to cut the chocolate (the very best you can afford) into chunks. I’m sure they’d be wonderful that way. But I went for ease and used very good chocolate chips. Traditional but no less wonderful. 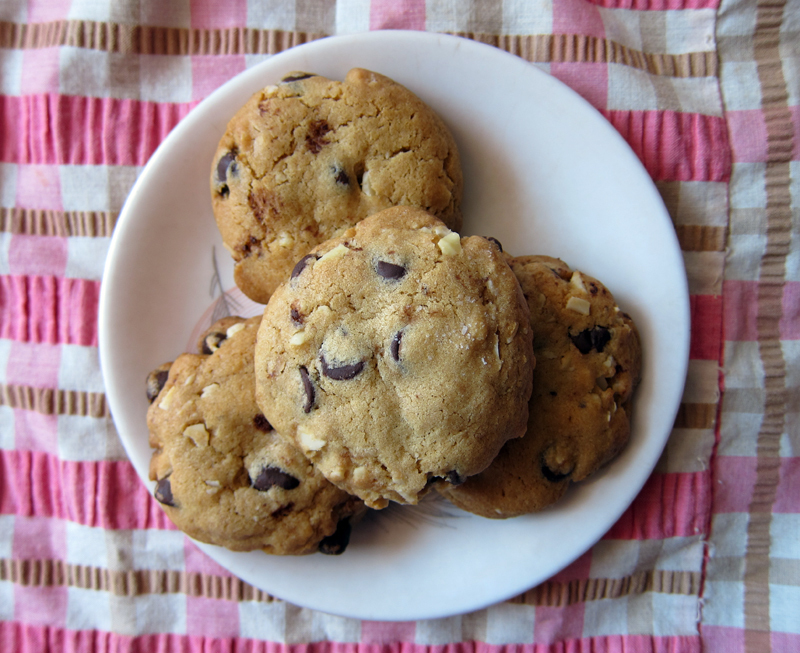 I also love nuts in my cookies, so I went ahead and used half a cup of sliced almonds (though chopped pecans or walnuts would be perfect too). And because I love a bit of salt to bring out the sweetness, half of the batch I sprinkled with some flakey salt. It was a good move. I recommend you do this too. These aren’t quite like the cookies I remember as a kid. They’re better. A whole lot better. And I know my mom would approve, secret stashes of chocolate chips stuffed into cheeks and everything. Bake up a batch and send them to your mom. elsewhere: Stop your boring meals – brighten them up with a sprinkling of za’atar. Don’t buy this condiment at the store, make it fresh and keep your meals exciting. Get the recipe over at Poppytalk. In a medium bowl, whisk together the flour, baking soda and salt. Set aside. In a large bowl, cream butter and sugars until light and fluffy. Add one egg at a time, blending well before adding in the second egg. Add in vanilla and mix until incorporated. Slowly add the flour mixture. Mix until just combined, taking care not to over mix. With a spatula fold in the chocolate and the almonds (if using). Using a tablespoon, roll into balls and place onto a prepared cookie sheet, about an inch and a half apart (I always line mine with silpat or parchment paper). Slightly flatten out the tops. If desired, sprinkle with a bit of kosher salt or fleur de sel. Bake at 360F for 12 minutes until lightly golden but still a bit gooey on the inside. Cool on wire racks. Oh man, these look ace. I’m totally overdue for a bake off, must make! That’s a strong statement! But, I think you might be on to something, especially with the flaked salt. I’m definitely trying these out soon! Thanks, as always, for another great recipe! Wow, the best, huh? Coming from such a chocolate chip afficionado that’s pretty convincing! Wow. Best is kind of strong and absolute. I will have to try this out for myself. But it does look pretty good. It’s funny how the back of the bag recipe really is THE choc chip cookie pinnacle for so many people (myself included). I’ll have to try these! I don’t know… I like original Toll House with walnuts (the traditional chocolate chip cookie in my house) and your maple-walnut variation looks pretty good, too. I’ll skip the salt, thanks. Redd, I know, they’re almost fighting words – but these are perfect in my eyes! Indeed, but I’m not exaggerating here, Rye. They are the best. Crispy, and chewy and rich. Love them. Sharyn, I’ve never tried the tollhouse version (in Canada, we had the Chippits version), but I like any cookie with walnuts! I’ve been meaning to try these and now that you have approved – it must be done 🙂 I whole-heartedly agree with your decision to sprinkle these with salt and I will do the same. I’ll be getting on this as soon as my schedule allows! Joanne, I’m not so much on the dipped in chocolate cookie, but I think these are pretty perfect as is. Enjoy! 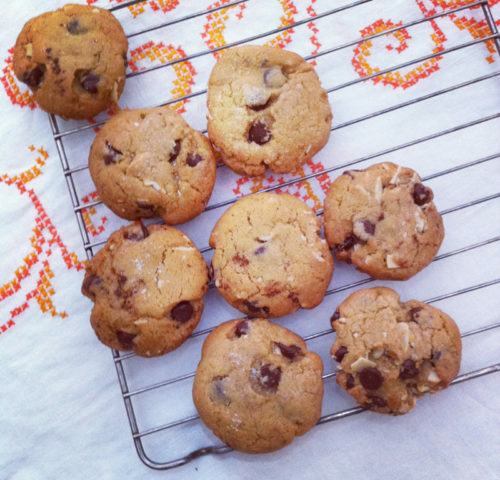 I just finished making these – I found them *very* tasty, but just a little bit dry. Maybe I baked them too long? When I checked them at 12 minutes they didn’t look quite done (my oven can sometimes be wonky, so I wasn’t surprised), so I left them in for a few more minutes. 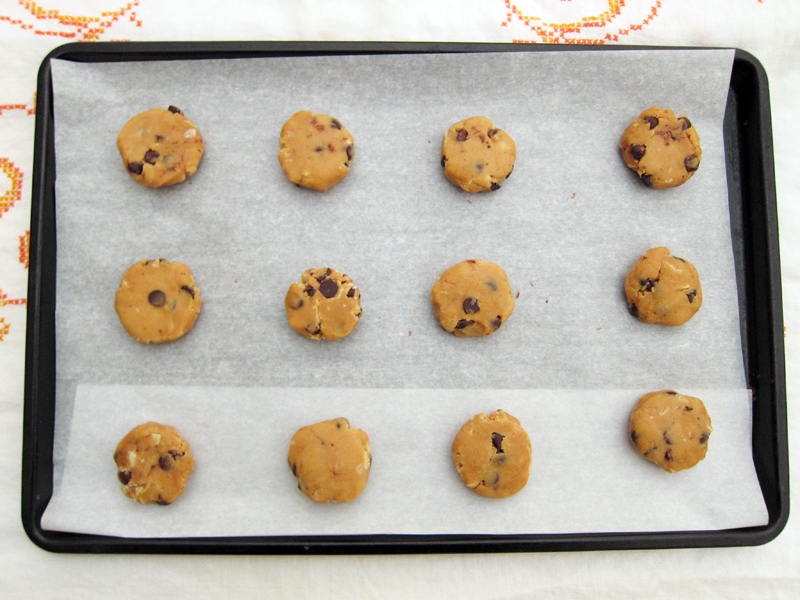 I’ll definitely try them again…maybe after I get a new oven thermometer! Thanks so much for the recipe!! Elizabeth, take them out after 12 minutes….they’ll still technically bake since they’re right out of the oven. Or if you’re oven is really wonky, leave them in another minute until they’re very lightly golden – they should seem a bit underbaked – but they’ll firm up nicely! Glad you liked them. I agree – these are the very best chocolate chip cookies in the world. I’ve been making them steadily for years since I first poached her recipe. They have become known in my circle as “Dana’s chocolate chip cookies” but I always try and remind people that I just adapted from the master. Love your changes! Yum! 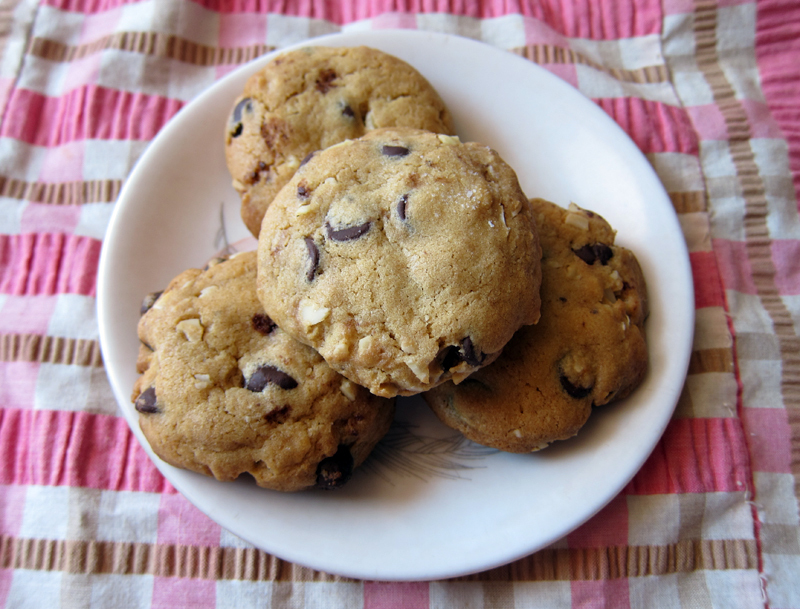 I’m a massive fan of cookies, and chocolate chip ones are the classic. Oh. The batter tastes absolutely wonderful!! I made a huge mistake though. Put too many too close to each other on the baking tray. So its all merged together now and will take double the time. In the oven right now 😀 Will tell you how it turns out. I have tried many a chocolate chip cookie recipe. My personal favourite is the classic drop recipe from the Joy of Cooking, I like the crispy edges and chewy centre. That being said, I made these last week, was a bit skeptical about the stiff dough and the need to flatten them, but they turned out great! My hubby loved them ( currently have another batch in the oven) and so did my colleagues. I find them to be a dense, but buttery cookie with a soft center. I did not use the nuts but added Maldon Salt Flakes to the tops and they were quite decadent. Everyone loved the salty sweet contrast. hmmm, salt sprinkled ON the cookie. Brilliant! Salt in the cookie and salt on the cookie, BRAVO! I also put salt in my milk and then also, on my toothpaste. Everything is the very best ever with salt. Found this blog looking for sandwich recipes but got distracted by this cookie recipe. I made them at 11PM last night to take to work so we can vote on “best ever”. I like how mine got crispy on the outside and still soft on the inside and I liked forming balls of dough (my husband thought they were potatoes at first) instead of the drop method.